This article is about the Yayoi period in Japanese history. For other uses, see Yayoi (disambiguation). The Yayoi period (弥生時代, Yayoi jidai) is an Iron Age era in the history of Japan traditionally dated 300 BC–300 AD. Since the 1980s, scholars have argued that a period previously classified as a transition from the Jōmon period should be reclassified as Early Yayoi. The date of the beginning of this transition is controversial, with estimates ranging from the 10th to the 6th centuries BC. The period is named after the neighborhood of Tokyo where archaeologists first uncovered artifacts and features from that era. Distinguishing characteristics of the Yayoi period include the appearance of new Yayoi pottery styles and the start of an intensive rice agriculture in paddy fields. A hierarchical social class structure dates from this period and has its origin in China. Techniques in metallurgy based on the use of bronze and iron were also introduced from China over Korea to Japan in this period. The Yayoi followed the Jōmon period (14,000–1,000 BC) and Yayoi culture flourished in a geographic area from southern Kyūshū to northern Honshū. Archaeological evidence supports the idea that during this time, an influx of farmers from the Asian continent to Japan absorbed or overwhelmed the native hunter-gatherer population. The Yayoi period is traditionally dated from 300 BC to 300 AD. During this period Japan transitioned to a settled agricultural society. The earliest archaeological evidence of the Yayoi is found on northern Kyūshū, but that is still debated. 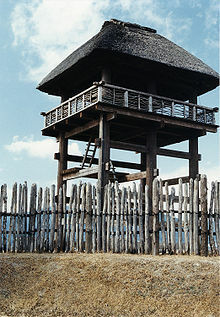 Yayoi culture quickly spread to the main island of Honshū, mixing with native Jōmon culture. A recent study that used accelerator mass spectrometry to analyze carbonized remains on pottery and wooden stakes, suggests that they dated back to 900–800 BC, 500 years earlier than previously believed. The name Yayoi is borrowed from a location in Tokyo where pottery of the Yayoi period was first found. Yayoi pottery was simply decorated and produced using the same coiling technique previously used in Jōmon pottery. 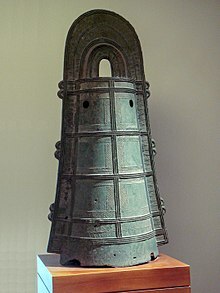 Yayoi craft specialists made bronze ceremonial bells (dōtaku), mirrors, and weapons. By the 1st century AD, Yayoi farmers began using iron agricultural tools and weapons. As the Yayoi population increased, the society became more stratified and complex. They wove textiles, lived in permanent farming villages, and constructed buildings with wood and stone. They also accumulated wealth through land ownership and the storage of grain. Such factors promoted the development of distinct social classes. Contemporary Chinese sources described the people as having tattoos and other bodily markings which indicated differences in social status. Yayoi chiefs, in some parts of Kyūshū, appear to have sponsored, and politically manipulated, trade in bronze and other prestige objects. That was possible by the introduction of an irrigated, wet-rice culture from the Yangtze estuary in southern China via the Ryukyu Islands or Korean Peninsula. Wet-rice agriculture led to the development and growth of a sedentary, agrarian society in Japan. Local political and social developments in Japan were more important than the activities of the central authority within a stratified society. Direct comparisons between Jōmon and Yayoi skeletons show that the two peoples are noticeably distinguishable. The Jōmon tended to be shorter, with relatively longer forearms and lower legs, more wide-set eyes, shorter and wider faces, and much more pronounced facial topography. They also have strikingly raised brow ridges, noses, and nose bridges. Yayoi people, on the other hand, averaged an inch or two taller, with close-set eyes, high and narrow faces, and flat brow ridges and noses. By the Kofun period, almost all skeletons excavated in Japan except those of the Ainu are of the Yayoi type with Jomon admixture, resembling those of modern-day Japanese. Northern Kyushu is the part of Japan closest to the Asian mainland. The origin of Yayoi culture has long been debated. The earliest archaeological sites are Itazuke or Nabata in the northern part of Kyūshū. Contacts between fishing communities on this coast and the southern coast of Korea date from the Jōmon period, as witnessed by the exchange of trade items such as fishhooks and obsidians. During the Yayoi period, cultural features from China and Korea arrived in this area at various times over several centuries, and later spread to the south and east. This was a period of mixture between immigrants and the indigenous population, and between new cultural influences and existing practices. 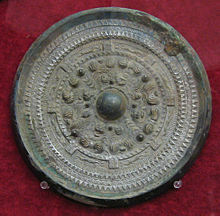 Chinese influence was obvious in the bronze and copper weapons, dōkyō, dōtaku, as well as irrigated paddy rice cultivation. Three major symbols of Yayoi culture are the bronze mirror, the bronze sword, and the royal seal stone. Between 1996 and 1999, a team led by Satoshi Yamaguchi, a researcher at Japan's National Museum of Nature and Science, compared Yayoi remains found in Japan's Yamaguchi and Fukuoka prefectures with those from China's coastal Jiangsu province and found many similarities between the Yayoi and the Jiangsu remains. Some scholars have concluded that Korean influence existed. Mark J. Hudson has cited archaeological evidence that included "bounded paddy fields, new types of polished stone tools, wooden farming implements, iron tools, weaving technology, ceramic storage jars, exterior bonding of clay coils in pottery fabrication, ditched settlements, domesticated pigs, and jawbone rituals." 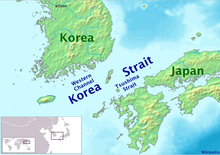 The migrant transfusion from the Korean peninsula gains strength because Yayoi culture began on the north coast of Kyūshū, where Japan is closest to Korea. Yayoi pottery, burial mounds, and food preservation were discovered to be very similar to the pottery of southern Korea. However, some scholars argue that the rapid increase of roughly four million people in Japan between the Jōmon and Yayoi periods cannot be explained by migration alone. They attribute the increase primarily to a shift from a hunter-gatherer to an agricultural diet on the islands, with the introduction of rice. It is quite likely that rice cultivation and its subsequent deification allowed for a slow and gradual population increase. Regardless, there is archaeological evidence that supports the idea that there was an influx of farmers from the continent to Japan that absorbed or overwhelmed the native hunter-gatherer population. Some pieces of Yayoi pottery clearly show the influence of Jōmon ceramics. In addition, the Yayoi lived in the same type of pit or circular dwelling as that of the Jōmon. Other examples of commonality are chipped stone tools for hunting, bone tools for fishing, shells in bracelet construction, and lacquer decoration for vessels and accessories. According to several linguists, Japonic was present on large parts of the southern Korean peninsula. These "Peninsular Japonic languages" were replaced by Koreanic-speakers (possibly belonging to the Han-branch) likely causing the Yayoi migration. The Yamato people are predominantly descedants of the Yayoi people and are closely related to other modern East Asians, especially Koreans and Han Chinese. It is estimated that the majority of Japanese only has about 12% Jōmon ancestry or even less. Most linguists and archaeologists agree that the Japonic language family was introduced to the archipelago during the Yayoi period. The earliest written records about people in Japan are from Chinese sources from this period. Wo, the pronunciation of an early Chinese name for Japan, was mentioned in 57 AD; the Na state of Wo received a golden seal from the Emperor Guangwu of the Later Han dynasty. This event was recorded in the Book of the Later Han compiled by Fan Ye in the 5th century. The seal itself was discovered in northern Kyūshū in the 18th century. Wo was also mentioned in 257 in the Wei zhi, a section of the Records of the Three Kingdoms compiled by the 3rd-century scholar Chen Shou. Early Chinese historians described Wo as a land of hundreds of scattered tribal communities rather than the unified land with a 700-year tradition as laid out in the 8th-century work Nihon Shoki, a partly mythical, partly historical account of Japan which dates the foundation of the country at 660 BC. Archaeological evidence also suggests that frequent conflicts between settlements or statelets broke out in the period. Many excavated settlements were moated or built at the tops of hills. Headless human skeletons discovered in Yoshinogari site are regarded as typical examples of finds from the period. In the coastal area of the Inland Sea, stone arrowheads are often found among funerary objects. Third-century Chinese sources reported that the Wa people lived on raw fish, vegetables, and rice served on bamboo and wooden trays, clapped their hands in worship (something still done in Shinto shrines today), and built earthen-grave mounds. They also maintained vassal-master relations, collected taxes, had provincial granaries and markets, and observed mourning. Society was characterized by violent struggles. The Wei Zhi (Chinese: 魏志), which is part of the Records of the three Kingdoms, first mentions Yamataikoku and Queen Himiko in the 3rd century. According to the record, Himiko assumed the throne of Wa, as a spiritual leader, after a major civil war. Her younger brother was in charge of the affairs of state, including diplomatic relations with the Chinese court Kingdom of Wei. When asked about their origins by the Wei embassy, the people of Wa claimed to be descendants of the Taibo of Wu, a historic figure of the Wu Kingdom around the Yangtze Delta of China. For many years, the location of Yamataikoku and the identity of Queen Himiko have been subject of research. Two possible sites, Yoshinogari in Saga Prefecture and Makimuku in Nara Prefecture have been suggested. Recent archaeological research in Makimuku suggests that Yamataikoku was located in the area. Some scholars assume that the Hashihaka kofun in Makimuku was the tomb of Himiko. Its relation to the origin of the Yamato polity in the following Kofun period is also under debate. ^ a b c Keally, Charles T. (2006-06-03). "Yayoi Culture". Japanese Archaeology. Charles T. Keally. Retrieved 2010-03-19. ^ Habu, Junko (2004). Ancient Jomon of Japan. Cambridge University Press. p. 258. ISBN 978-0-521-77670-7. ^ a b Shōda, Shinya (2007). "A Comment on the Yayoi Period Dating Controversy". Bulletin of the Society for East Asian Archaeology. 1. ^ Mizoguchi, Koji (2013). The Archaeology of Japan: From the Earliest Rice Farming Villages to the Rise of the State. Cambridge University Press. pp. 35–36. ISBN 978-0-521-88490-7. ^ Picken, Stuart D. B. Historical Dictionary of Japanese Business. Scarecrow Press. p. 13. ^ Imamura, Keiji. Prehistoric Japan: New Perspectives on Insular East Asia. University of Hawaii Press. p. 13. ^ "Annual Report on Research Activity 2004". www.rekihaku.ac.jp. ^ Seiji Kobayashi. "Eastern Japanese Pottery During the Jomon-Yayoi Transition: A Study in Forager-Farmer Interaction". Kokugakuin Tochigi Junior College. Archived from the original on 2009-09-23. ^ Lock, Margaret (1998). "Japanese". The Encyclopedia of World Cultures CD-ROM. Macmillan. Retrieved July 10, 2015. ^ Pearson, Richard J. Chiefly Exchange Between Kyushu and Okinawa, Japan, in the Yayoi Period. Antiquity 64(245)912–922, 1990. ^ ": University of the Ryukyus Repository" (PDF). ir.lib.u-ryukyu.ac.jp. ^ Jared Diamond (June 1, 1998). "Japanese Roots". Discover Magazine. 19 (6 June 1998). Retrieved 14 December 2013. ^ Mizoguchi (2013), p. 54. ^ Kidder, J. Edward, Jr. (1993). "The earliest societies in Japan". In Brown, Delmer (ed.). Cambridge History of Japan, vol. 1: Ancient Japan. Cambridge University Press. pp. 48–107. ISBN 978-0-521-22352-2. p. 81. ^ Mizoguchi (2013), p. 53. ^ "Long Journey to Prehistorical Japan" (in Japanese). National Science Museum of Japan. Archived from the original on 21 April 2015. ^ "Yayoi linked to Yangtze area: DNA tests reveal similarities to early wet-rice farmers". The Japan Times. March 19, 1999. ^ a b Jared Diamond (June 1, 1998). "Japanese Roots". Discover Magazine. 19 (6, June 1998). Retrieved 2008-05-12. Unlike Jomon pottery, Yayoi pottery was very similar to contemporary South Korean pottery in shape. Many other elements of the new Yayoi culture were unmistakably Korean and previously foreign to Japan, including bronze objects, weaving, glass beads, and styles of tools and houses. ^ Mizoguchi (2013), p. 119. ^ Karako-kagi Archaeological Museum (2007). "ヤマト王権はいかにして始まったか". Comprehensive Database of Archaeological Site Reports in Japan. Retrieved 2016-09-01. Wikimedia Commons has media related to Yayoi period.